Oxford Bank and Trust Co. of Oak Brook and Euclid Insurance Services of Itasca present a $150,000 replica check for a 2019 Fox Valley Habitat for Humanity home. From left are John Colis, Euclid president and CEO; Bruce Glawe, Oxford CEO; Soledad Martinez, Aurora, future home resident; Marisa and Juventino Marrufo, future homeowners; son Manny Mauffo and George Colis, Oxford board chairman. 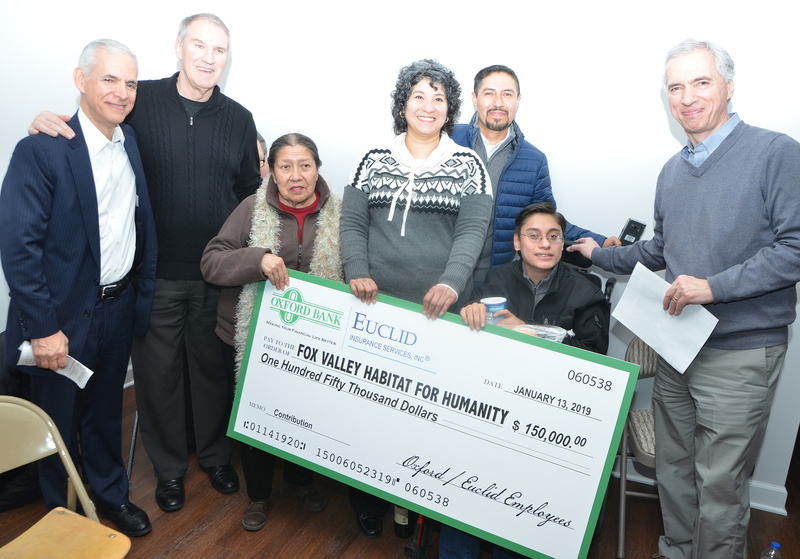 Oxford and Euclid have contributed more than $200,000 to support six Fox Valley Habitat homes in Aurora, North Aurora and Montgomery. (Al Benson photo). Aurora Police are investigating the shooting death of an 18-year-old Aurora man that occurred on the night of Jan. 23 on Aurora’s Near East Side. Daniel Perez-Alvarez of the 200 block of N. Ohio St., was shot around 9:50 p.m. near Claim and Beach Streets as he rode in a car with another man, age 19; and two juveniles ages 16 and 17. The shots were apparently fired from a passing vehicle. Perez-Alvarez was taken to an Aurora Hospital paramedics where he was pronounced dead at 12:17 a.m. on Jan. 24. There was no immediate description of the suspect vehicle nor any of its occupants. The shooting is not believed to be random. Persons with knowledge of the shooting are asked to call Investigations at 630-256-5500 or Aurora Area Crime Stoppers at 630-892-1000. Calls to Crime Stoppers are anonymous and qualify for a cash reward of up to $5,000 if an arrest is made off the information you provide. Calls to Crime Stoppers can be made 24-hours a day. Aurora Police have secured felony charges on a 33-year-old Waterman woman in connection with the theft of pickup truck that occurred on Jan. 17 in the 100 block of S. Broadway. Stephanie Bedgood of the 300 block of Cleveland St., is being held in lieu of $40,000 bail at the Kane County lockup after the charges were authorized by the Kane County State’s Attorney. Her charges include single felony counts of possession of a stolen motor vehicle and driving on a suspended or revoked license and a citation for not using her headlights. The episode began just before 6:30 p.m. when the truck’s owner left the vehicle running unattended in a parking lot. When he saw the truck being driven away, he hollered at the driver and then asked his friend to follow the vehicle while he called 911. The man’s friend did as asked and also called 911 giving dispatch operators his location and direction of travel. Respond officers were able to curb the vehicle at Flagg and Union and Bedgood was taken into custody without incident. A 28-year-old Carpentersville man walking his dog Saturday night along Dundee Road was struck and killed by a passing motor vehicle. According to reports from the Barrington Hills Police Department and Kane County Coroner’s Office, Michael Buchholz of the 1100 block of Chippewa Circle, Carpentersville, was walking his dog just prior to 11:48 p.m. on Jan. 19 west on Dundee Road (IL Route 68) when he was struck by a white 2009 Chevrolet Impala that also was traveling west. Officers located Buchholz, and East Dundee Fire Department paramedics took him to Advocate Sherman Hospital in Elgin, where he was pronounced deceased. He was transported to the Kane County Morgue, where an autopsy was conducted on Jan. 22. The preliminary findings were multiple injuries consistent with an automobile striking a pedestrian, the Coroner’s Office said in a news release. Toxicology samples will be collected and sent to a forensic lab at the time of the autopsy. The driver of the vehicle remained on the scene immediately after the crash and is cooperating with investigators, police said. Dundee Road was closed between Healy Road and Bateman Road for several hours while the crash was investigated. The crash remains under investigation by the Barrington Hills Police and the Lake County Major Crash Assistance Team. Hanover Township Emergency Services assisted with the road closure. Aurora Police Officer Skyy Calice will be honored as African-American Leader of the Year on Feb. 22 at the annual Aurora’s African-American Heritage Advisory Board annual Heritage Dinner. The crowning event of Black History Month, this annual celebration will present scholarships to achieving high school seniors, recognize community members for their contributions to Aurora. Calice is a Community Oriented Policing Officer Her interactions with students, educators and community members inspired her to establish the Girls Run the World mentoring program. Helping to guide young women at East Aurora, Metea Valley and West Aurora High Schools, the mentoring program develops leadership among the young women at each high school and gives them a safe place to discuss any issues they’re dealing with at home or at school. In 2018, Calice launched the Girls Run the World 5K Fundraiser, was presented the Chicago Wolves Hometown Hero Award, was named a ‘Face of 2018’ by the Aurora Beacon News and earned Mayor Richard Irvin’s Mayoral Commendation for Service. Social hour begins at 6 p.m. and dinner begins at 7 p.m.
Geneva’s Natural Resources Committee and the Geneva Park District Foundation are teaming together to sponsor this year’s Wine, Cheese & Trees fundraiser to help plant more trees in the community. The eighth annual event will be held from 7 to 10 p.m. Saturday, Feb. 23 at the Park District’s Persinger Recreation Center, 3507 Kaneville Road. Six wines will be paired with cheese, appetizers and desserts from local merchants. The evening also will feature live music, a silent auction, drawings, a “wine wall” and live auction. Some of the live auction items up for bid include an instant wine cellar; a seven-night stay in an eight-person condo in Bonita Springs, Fla.; an executive chef prepared meal for eight in the winner’s home; and a professional photography package. Tickets can be purchased for $30 per person or four tickets for $100 at Geneva Wine Cellars and Tasting Room, 227 S. Third St.; Geneva Chamber of Commerce, 8 S. Third St.; or online at squareup.com/store/WCT. No City funds have been used to purchase alcohol for this event. The Natural Resources Committee has pledged to use the fundraiser money toward bolstering the City’s downtown parkway tree canopy as part of its Greening Geneva initiative. To date, the committee has funded the planting of 150 trees in downtown Geneva, City Hall and at each of the schools in Geneva Community Unit School District 304. Two members of the Waubonsee Community College Board of Trustees plan to retire at the end of their current terms in April 2019. Richard “Shorty” Dickson, from Bristol, served on the board from 1972 until 1987 and again from 1989 until present. Serving for 45 years, he currently holds the distinction of the longest-serving community college trustee in Illinois along with a colleague from the College of Lake County. A retired insurance executive, Dickson currently serves as the board’s vice chair.